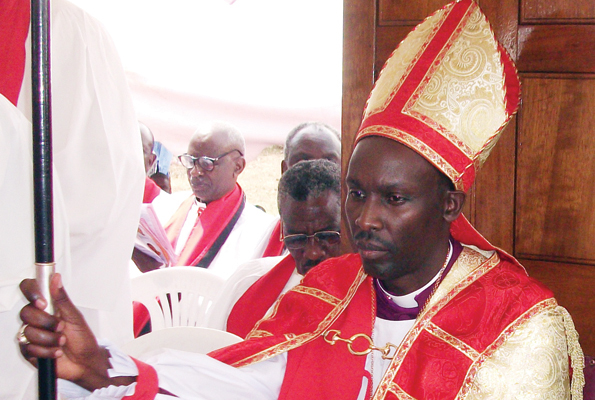 NTUNGAMO– The bishop of Ankole diocese Rt. Rev. Dr Sheldon Mwesigwa has said Christians can’t use force to make him submit to their demand to relinquish the Itojo Archdeaconry to be part of South Ankole diocese asking them to follow the right procedure if they want to split away from the current Diocese. Speaking during the Service he presided over at St Augustine Archdeaconry church of Uganda Itojo during his first visit to the Archdeaconry since Christians openly protested his failure to relinquish part of the Itojo archdeaconry, saying the secession can’t be forced. “I want to tell you anywhere you will go even when you go to the top most, using force you will never get anything. Whatever you do if you are on procedure you will achieve what you want.” Bishop Mwesigwa said. He said he had forgiven Christians who have been against him and will move with the church however saying he has powers to close the church if they remain adamant and fail to abide by the leadership. “I want to thank you for being saved, and born again, the challenges that happened here that you got saved on your heart. I want to tell you that on our heart we have forgiven you and we have no problem with you. Whatever went wrong we seek to be forgiven to,” he added. A section of Christians including the head of Laity Mr Myres Tumusiime Katahwa had attempted to block his visit to the archdeaconry. They however later withdrew but did not attend the Sunday church service mainly attended by students from the nearby primary schools (Itojo Boys Primary school, Blue hope primary school, Itojo progressive primary school and Itojo parents’ primary school) who comprised more than 60% of the congregation. There were no welcome songs from several church groups as its the norm for visiting bishops always and the gifts were handed over by the treasurer of the Itojo parish who was the only key member of the parish committee present at church. In July, Christians at Ruhanga Parish Church of Uganda rejected a priest sent to them by the Ankole diocese opting to have a lay leader as head of the parish. Bishop Mwesigwa said this was only self denial as they are denying themselves services since the Diocese had even aided them sending them a priest. The unfolding events broke loose on December 25 2017 Christmas day cerebration when Christians protested in the four parishes (Ruhanga. Itojo, Buhanama and Nyongozi) comprising of Itojo archdeaconry carrying posters with Bishop Sheldon crossed over. They demanded that the bishop give them away to South Ankole diocese in Ntungamo district, where they politically belong. Itojo Archdeaconry that takes the boundaries of Itojo sub county of Ntungamo district remain in Ankole diocese located in Ruharo Mbarara district despite other parts of Ntungamo district being in South Ankole Diocese. Bishop Mwesigwa asked Christians to remain calm and avoid spinning and rumours on the time flame and other issues at hand but rather seek God to guide them in the process. At least 100 pupils and other 15 Christians were confirmed during the service. The Itojo sub county chairperson Mr Ben Kwesigabo was the only politician from the sub county recognized during the service.